LPL Financial Holdings Inc. LPLA, along with its subsidiary, has acquired AdvisoryWorld for $28 million, with an aim to accelerate its digital capabilities and improve efficiency. Being a technology company, AdvisoryWorld provides investment analytics and portfolio modeling services to more than 30,000 financial advisors and institutions in the United States. Using the suite of digital solutions of this technology company, LPL Financial will be better poised to attract and serve client assets. Notably, LPL Financial is expected to continue offering AdvisoryWorld’s services as a stand-alone solution to the wealth management industry. In fact, the company plans to retain the talented team of employees that will continue evolving and expanding the AdvisoryWorld technology offering. 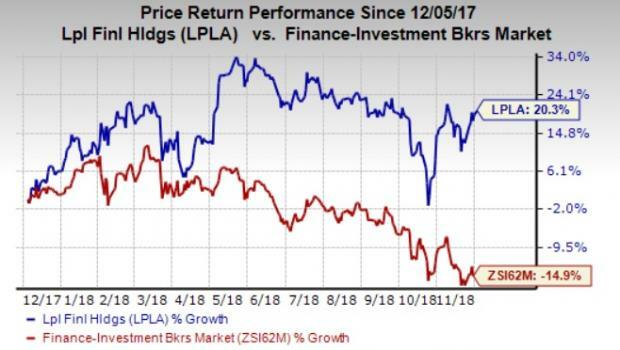 LPL Financial’s shares have rallied 20.3% over the past year against the industry’s decline of 14.9%. A few better-ranked stocks from the same space are Interactive Brokers Group, Inc. IBKR, E*TRADE Financial Corporation ETFC and TD Ameritrade Holding Corporation AMTD. Interactive Brokers’ current-year earnings estimates have been revised 1% upward over the past 60 days. Its shares have gained 55.2% in the past two years. The stock currently sports a Zacks Rank #1 (Strong Buy). You can see the complete list of today’s Zacks #1 Rank stocks here. E*TRADE Financial also flaunts a Zacks Rank of 1. It’s Zacks Consensus Estimate for current-year earnings have moved 6.1% upward over the past 60 days. The company’s shares have surged 50.1% over the past 24 months. Over the past 60 days, TD Ameritrade’s earnings estimates for the current fiscal year have been revised 2.3% upward. Over the past 24 months, the company’s shares have rallied 30.4%. It currently carries a Zacks Rank #2 (Buy).